OSWEGO — SUNY Oswego President Deborah F. Stanley, along with presidents and chancellors from more than 170 other colleges and universities, have signed an open letter urging President-elect Donald Trump and the incoming congressional representatives to accelerate progress toward a clean energy future. 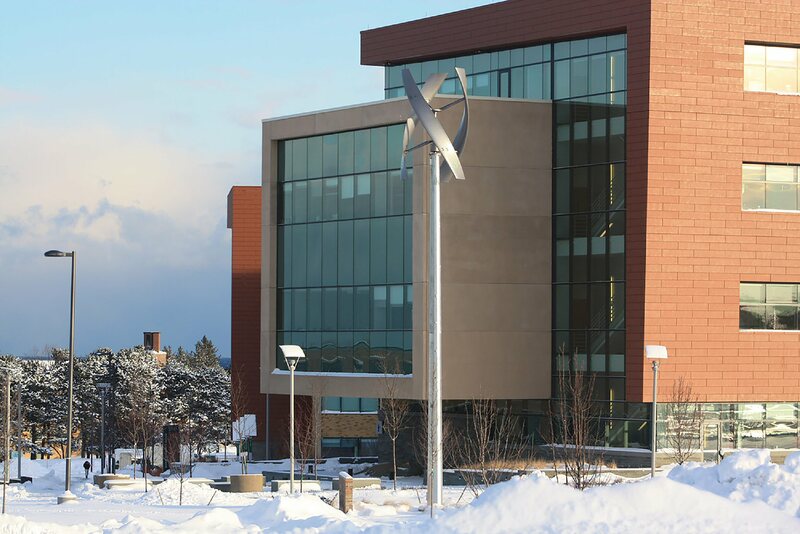 SUNY Oswego President Deborah F. Stanley has joined 170 other higher education leaders around the nation calling on the U.S. Congress and the president-elect to accelerate progress toward a clean energy future. The college achieved LEED Gold certification for its Richard S. Shineman Center for Science, Engineering and Innovation, which utilizes wind power, a 240-well geothermal field, solar panels and other advances to reduce fossil fuel consumption for heating, cooling and power. Through their action letter, organized by a diverse group of higher education institutions and the Boston-based nonprofit Second Nature, the leaders called on elected officials to support participation in the Paris Agreement, climate research and investment in the low-carbon economy. Leaders of schools across the nation expressed their alignment with the business and investment communities in supporting the science-based targets outlined in the Paris Climate Agreement. SUNY Oswego has a long history of striving to protect and preserve the environment, including voluntarily setting a carbon neutrality goal when, more than nine years ago, President Stanley signed the American College and University Presidents’ Climate Commitment. Providing guidance and structure to SUNY Oswego’s multi-front effort to achieve carbon neutrality by 2050 are a climate action plan, an Office of Sustainability and an Environmental Sustainability Team assessing and advocating for embedding sustainability in the curriculum and in co-curricular activities. Recognized in 2016 among the most environmentally responsible colleges by the Princeton Review, SUNY Oswego has been lauded for, among other actions, constructing or renovating campus buildings to LEED Gold standards; including creating a 240-well geothermal field to help heat and cool the Shineman Center for Science, Engineering and Innovation; installing several charging stations for electric cars; and emphasizing over the last decade the purchase of locally grown produce to serve in the campus dining halls. SUNY Chancellor Nancy L. Zimpher and the presidents of 13 other four-year State University of New York campuses also signed the letter, which Second Nature plans to formally share with President-elect Trump and members of the U.S. Congress on Jan. 13. For a complete list of signatories to the open letter, visit www.secondnature.org/higher-education-climate-action-letter. For more information on SUNY Oswego’s commitment to a sustainable future, visit www.oswego.edu/sustainability.